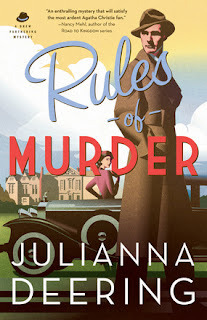 We had a little discussion the other day about whether Julianna Deering’s Rules of Murder was a cozy or more of a traditional mystery. Cozy mystery is a subgenre of mystery characterized by an amateur sleuth and the absence of strong language and “on-screen” gore. So yes, Rules of Murder is a cozy. But there are other sub-genres of mystery into which Rules of Murder might fall--British mystery and historical mystery, for instance, since it takes place in a manor house in England in the 1930s. And, of course, from Bethany, it’s an inspirational. So there's a lot in there for everybody. British manor house? 1930s? During what was called the Golden Age of Detective Fiction? No wonder Bethany is billing the series as Downton Abbey meets Agatha Christie! The time period and the references to mystery authors of the time, such as Agatha Christie and Dorothy Sayers were fantastic, especially if you enjoy them. Which I do. In fact, the hero, Drew Farthering, heir to the Farthering estate, is just a tad like Sayer’s Lord Peter Wimsey, but updated delighfully (without the annoying dialect writing common to the time and pages of descriptions of gardens). The writing not only transported me in time, but I felt it bore the crispness of that time period. The book has a feeling of age and of permanence, like it can stick around for a while. Characters and dialogue. I was seeing this book play in black and white, and with a British accent (except for Madeline). 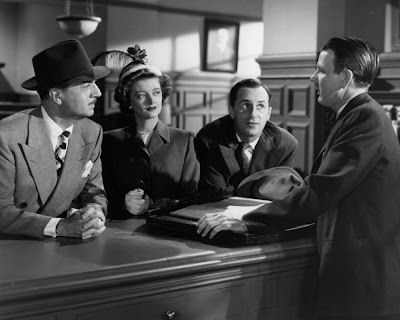 The witty repartee reminded me of the old Thin Man movies, with the same breezy chemistry that I always enjoyed between William Powell and Myrna Loy. Pure enjoyment. “I manage to make out most of the words,” Drew said as he handed the plate to her and began filling his own. “Monumentally solemn,” Nick put in, reclaiming his book and tucking it into his coat pocket. “Dare I say grim?” Drew asked, his expression thoughtful. Not only was there humor in the dialogue. There’s also a bit of background humor in the concept: Take ten "rules" for writing mystery, and then write a mystery that breaks or bends those rules. Read more about that here. Having come across those rules in the past, I felt that part was priceless, and enjoyed looking forward to seeing how she was going to do it. And do it well. But even if you don't know that, it still reads like a great novel. The romantic element was flirty and fun, and the inspirational content appropriate to the scene. It was a bit twisty at the end--which I personally happen to love. I'm a fan. I can't wait for the next one! And there's still time for you to get in on a chance for this week's giveaway of a copy of Rule of Murder. Just leave a comment below, including your email address in a safe format--such as PeterPan (at) Neverland (dot) com--and you'll be entered into our drawing. love the review. love the exerpt. looking forward to reading this book myself. As I haven't involved myself with many mysteries, I'm new to the cozy genre. Your review helped me get a better grasp on how they differ from normal mysteries. I'm taking the time to better acquaint myself with more seasoned writers/authors to help me strengthen my own writing, while learning the craft as well. This is one book, I know would definitely keep me glued. Welcome back DebH. And welcome, Shelley. Yes, I think you would enjoy this book. Here here! A sterling review for a sterling writer! Love it! Thanks, Lisa! Fun to review! looking forward the this - can you imagine how great this audio book will be? I've always loved the Nick & Nora Charles banter! Sounds like a great read. Please include me in the giveaway. Thanks for the opportunity! Hello, Renee. Welcome! And you are entered! And Deb, yes! And my audiobook came this morning! Is it Friday already? Wow this week of Julianna went by fast. It's been great fun, and many congrats to our Julianna. This is a great review, Barb. Superb. I love the excerpt. I could just picture the entire scene. BARB! You have an audio book? Even I don't have an audio book!!! Suzie yes, that's a great scene. And DeAnna? Dry your eyes. I pre-ordered it a while ago and forgot. What a wonderful surprise! My life is over . . .
Not to rub salt in the wound, but I ordered it too... I love audio books! Great review, and the novel is a lot of fun. Thanks for the excerpt.